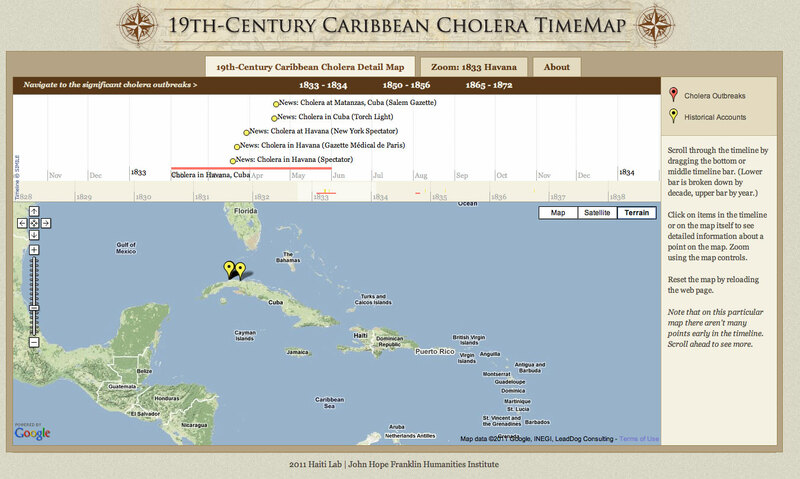 The Caribbean Cholera project was undertaken as part of the Franklin Humanities Institute’s Haiti Lab. Students in the ‘Representing Haiti’ class taught by Deborah Jenson and myself researched the growth, spread, and distribution of cholera in the 19th c., and presented the results in the form of an interactive map/timeline with links to original news footage and other historical source materials. The current project includes a zoomed-in view of Havana in 1833 as well. This project was published as part of an article by Deborah Jenson, myself, and the student research team in Representing Haiti, which appeared in the CDC Journal of Infectious Diseases in 2011.